Broccoli has been around for more than 2000 years, The name "broccoli" comes for the Latin word brachium, which means "branch," or "arm." Americans have grown it in their gardens for only about 200 years! The first commercially grown broccoli was grown and harvested in New York, then planted in the 1920's in California. A few crates were sent back East and by 1925 the broccoli market was off the ground. This vegetable is highly recognized for its anti-cancer nutrients. It is a cruciferous vegetable and member of the cabbage family which is helpful in preventing certain types of cancer. Broccoli was first grown in the Italian province of Calabria and was given the name Calabrese. Today there are many varieties. In the United States, the most common type of broccoli is the Italian green or sprouting variety. Its green stalks are topped with umbrella-shaped clusters of purplish green florets. Broccoli consumption has increased over 940 percent over the last 25 years. It's a good source of Vitamin A, and vitamin C, potassium, folacin, iron and fiber. Broccoli has as much calcium ounce per ounce as milk and contains a few important phytochemicals: beta-carotene, indoles and isothiocyanates. Phytochemicals prevent carcinogens (cancer causing substances) from forming. They also stop carcinogens from getting to target cells and help boost enzymes that detoxify carcinogens. So next time you sit down to eat and broccoli is on the menu. Remember it really is good for you! This meal is a wallet pleaser. Cost less then $3.50 to make. 20 minutes to cook. Serves 4. In skillet, melt butter over medium low heat. Add chopped broccoli to the skillet, season broccoli with salt, pepper and onion powder. Cook until just tender, about 5 to 7 minutes. Add turkey sausage, rice and chicken broth, stir well, cook until rice heated through. Enjoy! I like your quick and easy recipes. I was surprised to read how long broccoli has been grown in the US! Nice recipe, and I like how inexpensive it is! We love one dish meals. 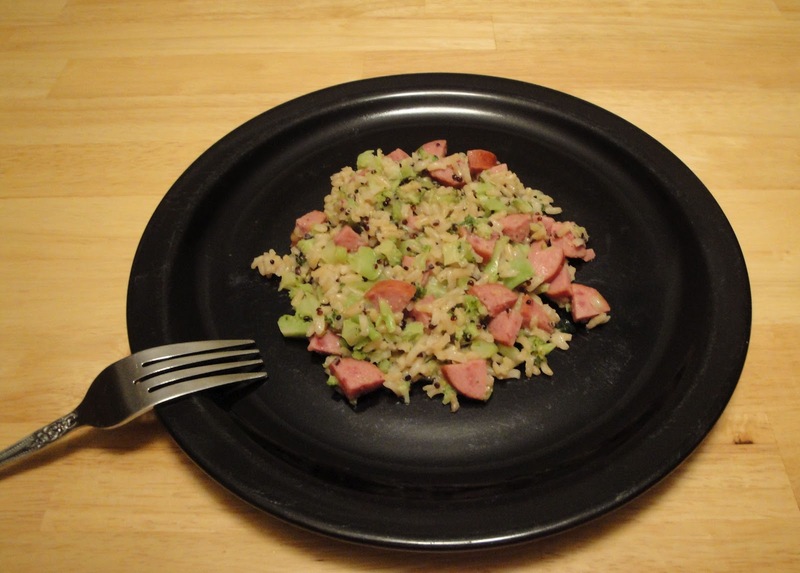 This is perfect with the broccoli, rice, and turky sausage for a quick dekicious meal. Easy peasy and delicious. Love it. Love the rice! By the way, thanks for stopping by and commenting on my Food Crazie blog. To show my appreciation for your support, I added this site to my Crazie Good Blog list on my blog. Thanks again! This is a healthy-looking dish! Kudos. This looks like a good healthy meal all in one pan. I've been looking for good healthy recipes--thanks for this one! Thank you so much. I have added your blog to my link list. Ooh, yum! This looks delightfully easy, with some of my favorite flavors. cheap and quick and delicious?! I'm sold! Great flavors with ease in preparation-those factors do make this a winning recipe! Yum! This is a healthy dish that I would make. Thanks for sharing. Thanks everybody for stopping by. I love hearing from you. I love one pan recipes like this! Yummy! Broccoli is my all time favorite veggie. I could eat it every day. Great quick dinner option here. And I love turkey sausage!! Yummy and Healthy! I think I will try it out tonight. Thanks!